Keeneland will host the Grade 2 Elkhorn Stakes, purse $250k, for the 30th time on Saturday. Set for 1 1/2 miles on the grass, it has pulled a field of 11 and will be run as Race 9 on a 10-race card. On the TimeformUS Pace Projector, Optimizer, making his first start back from a layoff that has spanned 196 days, projects to play out as the main speed. He will be closely followed by the free-running My Afleet, who has cut the pace in three straight races since being stretched out to longer distances, and by Java’s War, who is making his third start back from an extended layoff, having not been competitive in the first two. The longshot Xtra Luck, who has but a single win on turf to his name so far, is shown in fourth-place early. Optimizer will try to use his early speed to his advantage here, and he is certainly a very good horse when at his best, but this is a demanding distance to take on right off the bench, and the reality is that he is a better horse going shorter than this. We will note, before moving on, that he came up big when stepping back into action from his most recent layoff. Racing over 1 1/16 miles in the Bernard Baruch at Saratoga last summer, Optimizer rolled up from behind a fast pace (note Pace Figures/fractions shaded red) to put a real scare into the venerable Wise Dan before just missing in a photo. He has run well over this distance once before, but that was way back in 2012, and his two most recent attempts to get this far have been ugly disasters. Of those expected to be in closest contact to him, we like the chances of My Afleet most. He has never been tested by this kind of company (top Race Rating so far: 99; preliminary Race Rating for the Elkhorn 111), but he has improved since distance was added to the mix, and he has been nothing if not a relentless fighter through the stretch. 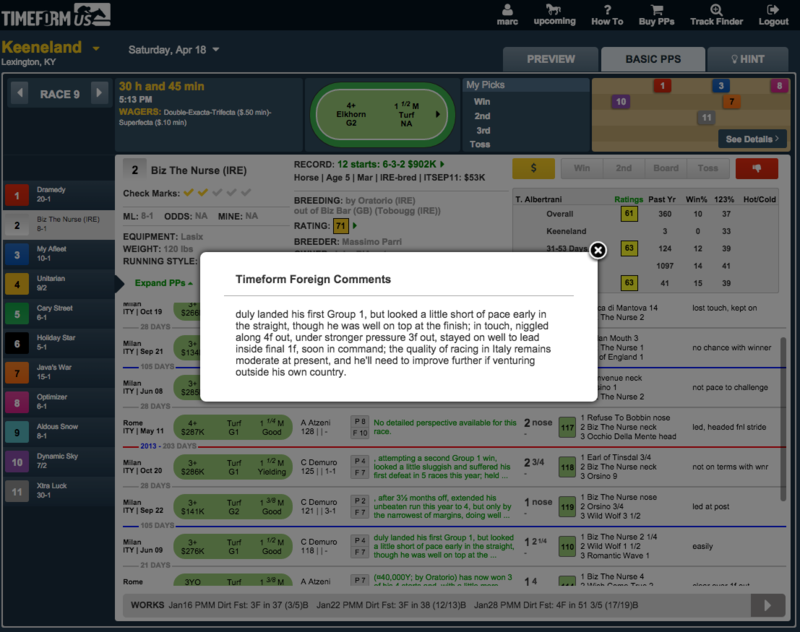 He has a layoff of his own to deal with here, and he may well have to adjust to a faster horse getting out in front of him early, but he is likely to be a square price, and we like what we’ve seen from him in these turf marathons. A Group 1 winner in Italy over this distance prior to arriving stateside, he wasted no time getting his feet wet when posting a convincing win over allowance company. He won 4 straight races as a 3yo in Italy, including that Group 1 success, but, as noted by the Timeform analysts overseas in the detailed perspective of that performance (available in TimeformUS pps), the quality of racing in Italy was moderate at that time. He did not win a race over there as a 4yo. He defeated a solid, if unspectacular, field at GP last month (the 2nd-3rd-4th finishers all raced for a claiming tag in 2014), and he did so with the benefit of a fast pace to close into (note Pace Figures/fractions shaded red). He is 6-for-12 lifetime, and far from impossible in this race, but we would hold out for a much bigger price than is likely to be available. Unitarian: This horse really turned his career around once routed to these longer-distance turf races. He won this race last year with a long and very wide run into a fast pace (also cut by Optimizer), and he has gone on since then to back that race up just fine. He caught soft ground upon his return from a layoff last April, and he finished gamely despite a wide trip in a race that was holding together up front all the way. Wide again in his next two starts, he once again rallied gamely late without quite enough. His stamina was on full display in his last start, which came over 2 miles at Gulfstream Park. Considering the odd distance of that race, we won’t place too much stock in the new career top speed figure of 111 Unitarian received that day. But his strong finish at the end of that 2-mile trip was quite an impressive sight. He has clearly found a home going longer on the grass, and with Optimizer out there ensuring a solid pace, Unitarian figures to be a strong late threat. Holiday Star: He defeated Unitarian in the Sycamore over this course and trip last October, though he had plenty working in his favor that day. Unitarian was off the layoff, while Holiday Star was in the midst of regular racing. The ground was soft, which Holiday Star had already shown himself to handle, while Unitarian had not. And the pace held together strongly there after modest early fractions, which was an advantage to the pace-tracking Holiday Star. Still, he is another who has handled distance just fine. He was disappointing when last seen at Del Mar in November, but we would just note that the turf marathons out there are a different animal from the ones contested on the East Coast. In California, there still seems to be a premium on speed, no matter the distance, and that Hollywood Turf Cup featured a scorching pace by the standards of an eastern shipper like Holiday Star. The leader of that race went an opening quarter timed in 23.1 seconds. The half was 47.1. Holiday Star, who likes to take up a tracking position early, was fairly run right out of contention out there. He can pull a better trip here, and if there is any “give” in the ground (the course at Keeneland was labeled “Soft” on Thursday), that would be to his benefit. Dynamic Sky: He has yet to win over this 1 1/2-mile trip from 3 attempts, but he has acquitted himself well in finishing in the money each time, including a solid 117 TFUS Speed Figure performance in last year’s Canadian International. He defeated, among others, Unitarian in winning the Red Smith at Aqueduct last fall, and, while he eventually worked a good trip in that race, he had to show some nice agility in order to get himself into the right position, and he really finished that race off well at the end. He will need to work out a trip from post 10, and we don’t love him as the ML favorite (to be fair, we would say that about anyone in here), but he is another who likes some cut in the ground, and he has a race to get to that makes him a big threat. 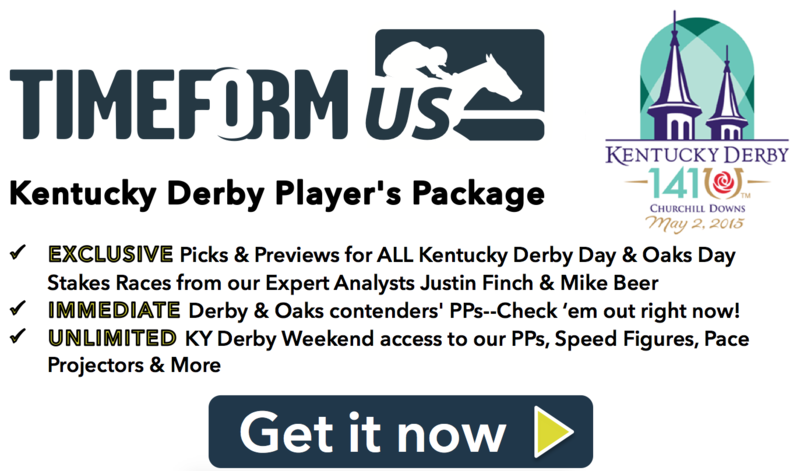 The Play: With Optimizer in the race to ensure some pace, we like the chances of Unitarian and will make him our top play–assuming the ground is in the good-to-firm range. We will bet him to win at 6/1 odds or better, and we will play him in exactas with My Afleet, Holiday Star, and Dynamic Sky.